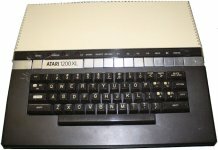 The 1200 XL was unsuccessful perhaps because of its incompatibility with the earlier Atari 800. It was quickly replaced with the Atari 600/800 XL. Richie uses the school's Atari to recreate RALF's operating system after its malfunction. He later uses the 1200 to communicate with NASA to track the target of the satellite dish transmissions.